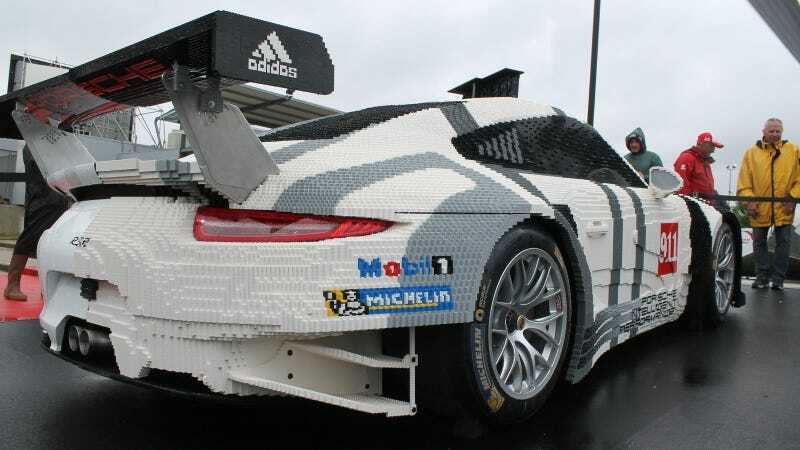 Behold the ultimate Lego kit: half of a Porsche 911 RSR! Over 380,000 bricks went into making half of this car, and it’s one of the most detailed and wonderful Lego builds yet. The differences between the two sides on this display for the 24 Hours of Le Mans mean that it isn’t quite seamless, but it’s pretty close. Even the decals are there, lovingly recreated in the colorful little bricks. Note to self: if I lose the Porsche crest on my hood, there’s always Lego. This one looks pretty good! Even hood pins were recreated with loving care. Like everything at Le Mans yesterday, it had to be made to withstand a bunch of rain. If I had my glasses off and was sort of groggy, I’m not sure I’d be able to tell the difference between the two sides. It’s a good 100-foot Lego job with all the right details. They even managed to get the gradient in the “Porsche Intelligent Performance” sidebar down. Check out the funky fenders around the wheels, too. Almost the real thing! Naturally, my toy approved of this toy. Best of all, it lights up at night. Is it weird that this is something I’d really like to drive? Between a car half-made of Legos, the race cars (duh) and all the weird little cars that we don’t get in the US, I kind of feel like I need to drive everything at Le Mans.